John Hesse of Michigan State University organised an excursion for students. A year ago planning started. At the planned date, the weather was to bad for landing their boat, but today they manage to visit this town. Geir Wing Gabrielsen has prepared an inspiring lecture about his research into effects of POP's on arctic wildlife in the Marine Laboratory. 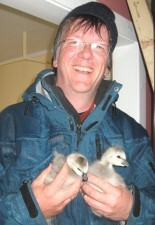 After the lecture, i take them out for a walk with the goslings. 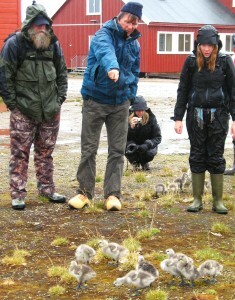 Meanwhile I explain about gooseology and birdhealth. We take the goslings out for a walk. 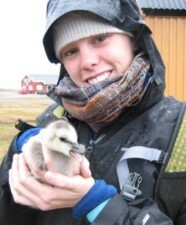 Each student is carrying a gosling out of our station to an area away from the arctic foxes. 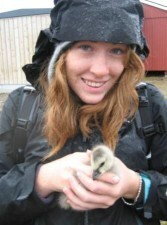 In the rain, I lecture about geese and the experiment with captive goslings. 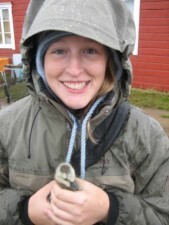 With the goslings in captivity, we will measure the development of their immune system , digestive system and diet choice. All these components change during development and are highly relevant for growth and habitat use. pictures taken by John L. Hesse and Patrick Lederle.